When I put it out there to the Facebook world that I was looking for a tortilla soup recipe, I wasn’t sure what kind of response I would get. First of all…thank you to everyone who sent me their recipes! Secondly…holy moly there are lots of different ways to make tortilla soup! I decided to take bits and pieces from different recipes and make one up myself. Daring, I know. Since this was a new kind of adventure, I thought I’d share it with you, no matter how it turned out. Preheat your oven to 425 Degrees. Take 2 of the tortillas and slice them in thin strips, place on a baking stone or cookie sheet and toss with olive oil. Bake for 10 to 15 minutes, checking and tossing again and salting if desired halfway through. While you’re at it, chop up the remaining 4 tortillas into bite size pieces, set aside. In a large dutch oven or stock pot, sauté the chicken on medium heat in a little bit of olive oil. Add the chicken broth, black beans corn and tortilla pieces. Stir well. 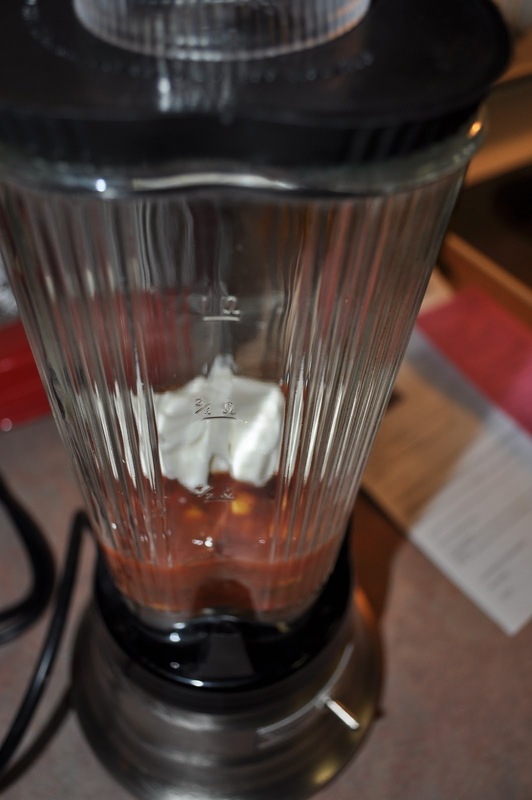 In a food processor, or a blender if you’re lazy like me, combine the salsa and sour cream. Add it to your soup. Stir well. At this point, you may wish to season it with different spices. I used some red pepper flakes and a touch of salt. Bring to a boil, then reduce heat to low and let it simmer for 15 to 20 minutes. Dish it up and top with the crispy tortilla strips. 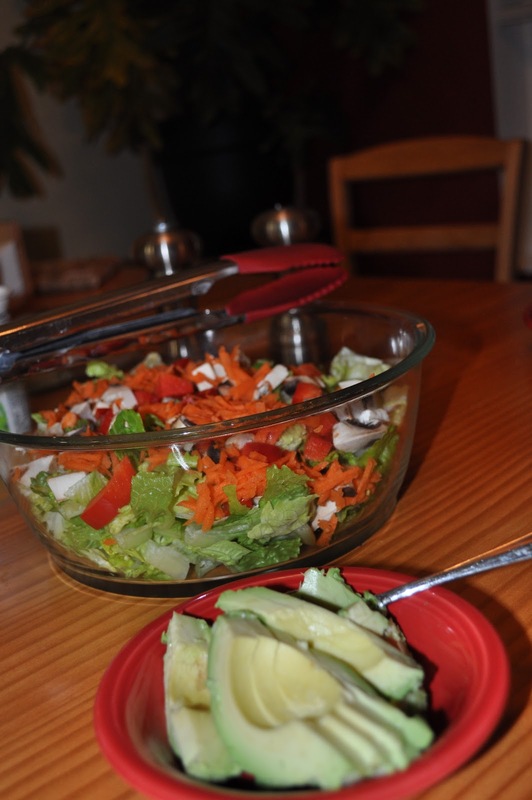 I also served it up with some shredded cheese, sour cream and sliced avocado along with a nice, big salad. I got so caught up in my excitement to eat it that I forgot to take a photo of the soup all dished up and topped with cheese and sour cream. Andy really enjoyed the soup (WIN!) and you know it’s good when he goes back for a second HUGE bowl AND takes some for lunch the next day. My husband? Not a leftover guy. And for the double win? One serving of this soup, including cheese and sour cream on top was only 350 calories! Things I will try next time: chopped onion sauteed with the chicken. And maybe some garlic, because really, garlic makes nearly everything better. This entry was posted in food, Recipes on February 3, 2011 by katherine. That looks so good (and easy – another win!). I'm excited to try it! Yum !! Katherine that looks so good! Thanks for sharing your recipe..
That's one even I could do. Thanks for sharing. Glad you like it..it is seriously yummy! I'm normally super intimidated by soups and this was so easy! Hahah, yes, a double win. And also? A great way to use up the leftover roasted chicken that we never seem to eat!